After you have identified your research approach (deductive vs. inductive), problem statement and research question(s), it is important to determine what theories and ideas exist in relation to your chosen subject. Want to learn more about doctoral research? 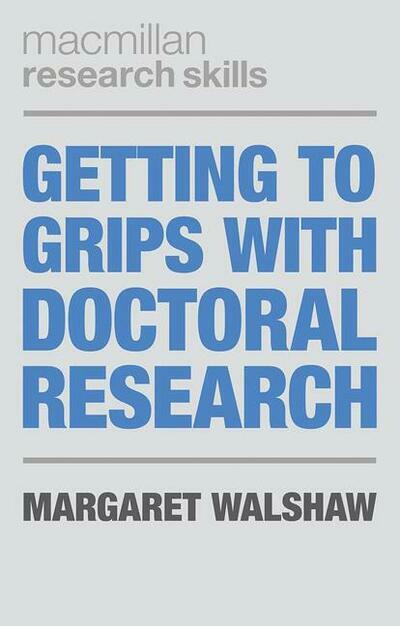 Scribbr recommends reading the book Getting to Grips with Doctoral Research by Margaret Walshaw. Provides greater understanding of the doctoral process and the requirements for success. Recognises the challenges facing students and offers practical solutions. As your question is very general, it's hard to formulate an answer. Can you please advise me if it's correct to use as an ecological model of social inclusion , as background framework for my study ? My research is about an description of existed assistive robotic systems, and how they could be help to provide assistance for the social inclusion of visually impaired consumers, I will analyze the collected testimonials based on the categories of the above model. That's an interesting topic! Unfortunately I cannot really give advice to this regard, since I am not familiar with the topic. We would recommend to discuss this with your supervisor, since he/she knows best which information can be used for your thesis. Thank you for the question! First, I would select the key concepts of your research question. Then, you define those key concepts by finding relevant theories. You map out the theories and literature that is relevent to your research question. Furthermore, it is also helpful to analyze the research field that you are writing about. Hopefully this will help you writing your theoretical framework! Hi am writing a paper on violation of women's economic rights,how can I write my theoretical framework thanks! Hi Prisca! Thank you for the question! It is a tough one, since I do not know much about your topic. I would suggest creating a historical framework of women's economic rights. First start with how it was, then move to the current times and try to find enough literature on the topic. Hopefully this will help you creating your theoretical framework! Is a theoretical framework different from a theoretical model? and how do i construct a theoretical model for my thesis "Company Fundamentals and Stock Returns in Sudan"? Hi Abdu, thank you for your question! They are actually the same, you map out the essential theories and literature in relation to your subject. With regard to your subject, it is hard for me to say exactly what you should do, since I do not know anything about your subject! However, I would suggest that you first take a look at the most important parts of your thesis. In your case, Company Fundamentals and Stock Returns and then try to see if you can find out how they have changed with time in Sudan. I do suggest also discussing this with your supervisor! Good luck! I really appreciate your hint on theoretical framework. But I need your guide on my topic "Postmodernism and Biblical Authority in Africa Christian preaching "
Thank you! Unfortunately, we cannot help you with the content of your theoretical framework, as we don't know enough about your field of study. This article has, by 98%, solved my problems relating to understanding the meaning and purpose of conceptual and theoretical framework. Thank you very much! Hi. I hope you would help me in my thesis theoritical framework or give me some ideas about my topic "the percieve effect of martial law to the business management of night market stores owner".. please do reply. I'm writing on modeling as a process of learning: a Theological reflection on the impact of parental behaviors on children. I'm finding using framework in my literature review. Kinda finding it difficult to understand theoretical framework. That sounds like an interesting topic! Hi! I'm currently writing a research paper about the "Most effective method of teaching between Traditional and Modern method". What I would like to know is what will my theoretical framework would be. Thank youu! On this page you can find an example of a theoretical framework. Unfortunately, I cannot help you with the content as I am not familiar with your topic nor field of study. hello . can you teach how to construct a theoretical framework?? Hi Erica, the tips and explanations in the article above should help you a long way. Next to that, it might help to take a look at the example of a theoretical framework. I'm writing a research proposal and my topic is "the impact of gender based violence on first year university Students' so what I would like to know is what my theoretical framework would be. I read but I'm not quite sure if I understand. With the theoretical framework you frame your research and show that you are knowledgeable about the key concepts, theories, and models that relate to your topic. So I advise you to start looking for the most important and influential sources and authors in the field of gender and gender based violence. Make sure to cover the theories and ideas that exist in relation to the chosen subject. In short: lots of reading :). Hi ! I don't really know what is the true structure of theoretical framework? Can you give me some sample theoretical framework? Ang also i need some ideas on how i will work on my topic about effectiveness of water conservation campaign.. Thanks in advance? On this page you can find an example of a theoretical framework. Unfortunately, I cannot help you with the content as I am not familiar with your topic and field of study. I'm sorry, we can't help you with this question, as it is quite specific. Maybe your mentor or professor can provide some ideas? Thank you very much for contacting us. Due to the fact that we are not specialists in your field of study and we do not know the requirements of your university, we cannot help you with a question that specific. However, a literature review will help you finding key concepts other researchers defined. The information on the topic above (Theoretical framework) has been very useful. The communication is straight-forward and in simple and understandable language. I think you have succeeded in demystifying one big problematic area in research. Thumbs up!!! Hi again: I forgot to mention that my topic is ethnic parent's views on heritage language maintenance and their practices and challenges in the U.S. My theoretical framework is Ecological Systems Theory by Bronfenbrenner. As I said before I talked about my framework in chapter 2, then analyzed my data in chapter 4 without mentioning this theory. I am now planning to talk about my results in the discussion chapter ad it relates to my theoretical framework. Does this make sense? I hope I am doing it correctly. Hi Maryam, yes this makes sense. You can also use the structure of your document like we explain in the structure article. Unfortunately I don’t, but I hope someone else who is reading this article can! Unfortunately, I am not an expert in this area! "An analysis of job satisfaction of company employee"
Please i dont know if we get the factor affecting etc..
Hi Vane, hopefully someone can help you who is reading this article too. Hi Safia, Unfortunately I don't, but I hope someone else who is reading this article can! Dear Jone, hope that someone can help you with this that is reading this article. Thank you Sarah your tips are very clear and practical, be blessed. how do I construct my theoretical framework. my topic is evaluating profitability of maize processing. Unfortunately, we cannot help you with the content of your thesis. Maybe someone else who reads the article and your question? its focus on gathering and collecting Recipe. I am sorry. I do not know anything about this topic. Perhaps that someone else that is reading this article can help you? I think this is very helpful. But my problem is how to search for the theoretical framework of my topic. For instance I am writing on the topic sum of interior angle is 180 degrees. Dear Awinzure, You can try to look in several databases for the right info. For instance Google Scholar. Good luck! Hi Maiyo, Then you should focus on the most important concepts in your thesis. For you that would be for instance, value added tax. What is the history of value added tax and what are the latest developments? Good luck! hi ! i'm currently doing my ungergrad thesis. I am completely lost when it comes to theoretical framework. I look it up in the internet and it would seem that it will be compose of paragraphs, but my other classmates presented it as a sort of map. what is a theoretical framework really is? Hi Eriele, there are not a set of rules that you should follow when writing you framework. Both the options you give a pretty good structures of a framework. A map can be convenient when you have to use a lot of sources. When your framework is not that complex a map is not something you really need. Hope this helps!